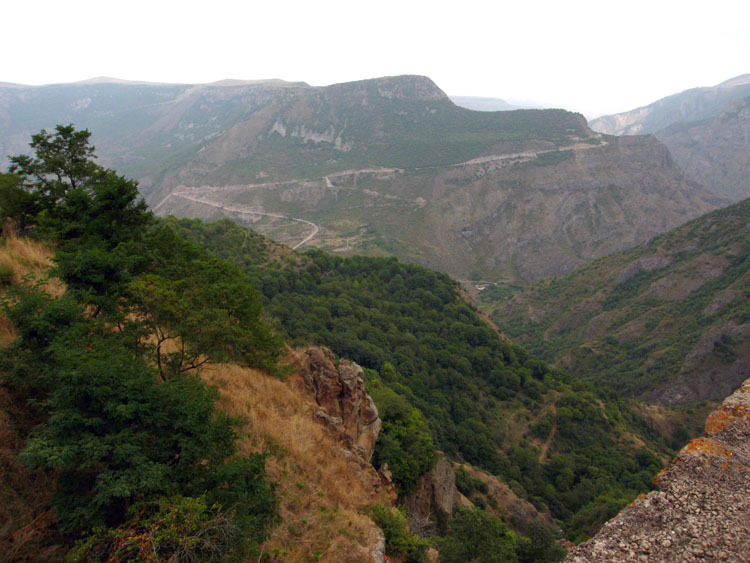 Tatev monastery is situated near the village of the same name in part of Zangezur - ancient Syunik. Tatev monastery was built during the 9-13th centuries as an Armenian intellectual center where philosophers, musicians, painters, calligraphers, and monks lived. This monasterys teachers produced manuscripts for the whole Armenian world. The complex was begun between 895 and 906. St. Gregory the Illuminator, who spread the word of Christ throughout Armenia, is buried here in a small church built in 1295. The tall «Gavazan» was engineered and erected in 904, with a khachkar on top. The earthquake of 1931 caused considerable destruction, but the parts that survived enable us to judge about the artistic merits of the complex. The main monument is the Church of Poghos and Petros (Peter and Paul) built in 895-906. It reproduces the type of domed basilicas of the 7th century, but has new features. Tatev ensemble fits in perfectly with the mountainous landscape around it. A large church, dominating the surrounding structures and visible from afar, is the architectural and artistic center of the ensemble. The residential and service premises, arranged in a single row on the perimeter, set off the polyhedral rock foundation and seem to be an extension of it. This gives the ensemble an original and majestic appearance.